“Eight hundred,” says the auctioneer. “900 … 1,000 … 1,100 …” Sold. For 1,200 Libyan dinars—the equivalent of $800. He has been offered up for sale as one of a group of “big strong boys for farm work,” according to the auctioneer, who remains off camera. Only his hand—resting proprietorially on the man’s shoulder—is visible in the brief clip. 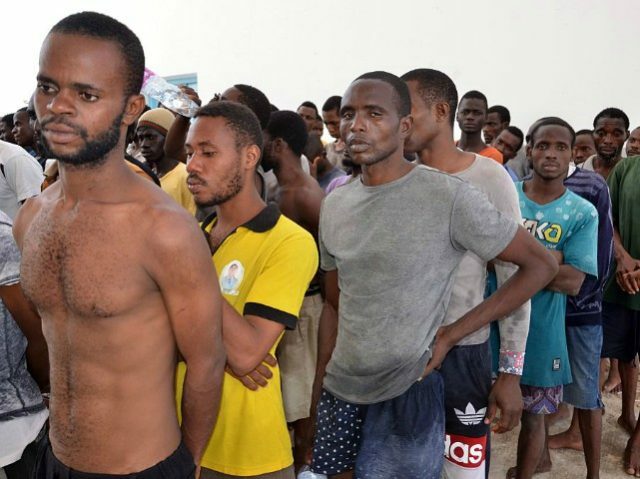 The slave trade is described as a hideous consequence of effective anti-smuggling operations, which left the smugglers sitting on a large number of refugees they could not slip past the Libyan coast guard to final destinations in Europe. The criminal gangs decided to sell off these surplus refugees as slaves. One young man from Nigeria profiled in the article was sold as a slave, reclaimed by the smugglers because they decided the customer did not pay enough, resold several more times, and then ransomed back to his family in Nigeria. The Libyan authorities, who seemed at least dimly aware of the problem, promised to investigate CNN’s findings. One possible solution is a repatriation operation that will return migrants from those undeniably hideous camps to their countries of origin. Reuters reports that the first repatriation operation from Libya to Eritrea, Ethiopia, and Sudan began over the weekend, but it is off to a slow start. Only 25 refugees were evacuated to temporary quarters in Niger—fifteen women, six men, and four children. The U.N. believes about 43,000 refugees are currently camped in Libya. Europeans may find themselves in a no-win situation where literally everything they can do to slow the tide of migrants from Africa and the Middle East is swiftly pronounced inhumane, based in part on appalling conditions in places like Libya. The international media community seems to have little appetite for blaming the leaders whose policies prompted mass migration into Europe, or those who transformed Libya into the lawless wasteland of terrorists, warlords, and criminal gangs it is today. Reuters mentions that one reason the repatriation program is proceeding so slowly is that “most countries closed their embassies in Tripoli after fighting escalated there in 2014.” Three years later, the demand for new embassies in chaotic Libya evidently remains low. Migrants are still drowning in the Mediterranean, incidentally. It just is not reported the way it once was, because the political objective of opening Europe’s borders was accomplished. The European Union has been criticized for not doing enough to rescue migrants when their ramshackle smuggling ships capsize. The EU border control agency, Frontex, was savaged for suggesting that charity rescue operations were creating a “pull factor for migrants and traffickers” who see the risk of crossing the Med diminishing. If the EU devotes more resources to rescuing migrants at sea, they will be excoriated for returning them to horrendous conditions in Libya that include deprivation, abuse, and now chattel slavery. Allowing the migrants to put out to sea on their own has degenerated into a deadly game, as so many border security issues are in the developed world.